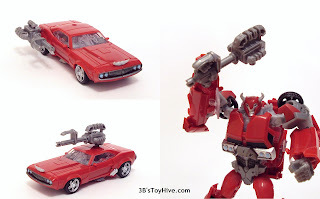 I decided to take a break from snapping pictures for upcoming WWE reviews by posting today's review of Cliffjumper from the Transformers: Prime animated series. This is a bit of a rare review for the Hive where I'll actually be looking at two different action figures based on the same character. So without further ado, here is TFP Cliffjumper. Both of them! Last year, right around this time, Hasbro released the first wave of toys based on the Prime cartoon. The series, dubbed "First Edition", included two Voyagers (Optimus Prime & Bulkhead), five deluxes (Arcee, Bumblebee, Cliffjumper, Starscream and Vehicon) and a box set that included deluxe versions of OP and Megatron plus figurines of the three kids featured on the TV show. There was a lot of excitement when they were first announced, but that quickly turned to torment when it was revealed that the FE series was limited in the United States and would soon be replaced by the "Robots in Disguise" series featuring simpler transformations and an overall more kid-friendly look. I was only able to pick up Arcee & Starscream from the FE wave, but wanted that Cliffjumper badly! I wasn't willing to pay eBay prices, so eventually had to settle for the RID version. Not a bad fiugre, per se, but he is overshadowed by the FE version, without a doubt. In robot mode FE Cliff is noticeably taller than his RID counterpart, which is true of most of the other characters who've received figures in both series, except Starscream who was released as a Voyager in RID. On the FE version you get a nice boxy look, very similar to how Prime Cliffjumper is depicted in the cartoon and prequel comics. The RID version has nicer legs and feet, but his arms are terribly misproportioned. The forearms look way too long with his upper arms looking comically short. The other big difference is the color of each figure's interior parts. Both figures have basically the same red color for the car parts, but RID 'jumper has grey pieces for his waist, elbows, knees, hands, etc., while the FE figure has black in those spots. Personally, I like the black and red combo much better. The First Edition figures are generally regarded as having more complex transformations than the Robots In Disguise versions. I'd have to say that both CJ's have equally intricate conversions. What amazes me is that they're almost completely opposite transformations. The FE figure's arms form the back end of the vehicle while his legs form the front end and his chest really converts into the roof of the car. On the RID figure, the legs form the back end while his arms form the side and front of the car. The roof, hood and trunk lids are kibble on his back and his chest is made up to look like the roof of the car, but just ends up underneath the vehicle. FE CJ is also larger in vehicle mode. The other noticeable difference is that FE Cliff has dark windows while the RID figure's are completely transparent. That wouldn't be such a big deal if RID Cliff's false chest didn't include painted black windows. No consistency within the toy. Shame on you, Hasbro. Aside from that both vehicles feature painted side-exhaust pipes, wheels and bumpers. The RID gets some black detailing over the rear bumper while FE's is just solid silver. FE does have an autobot logo printed on one side of his vehicle, it's even on a raised area, but oddly the same raised area appears on the opposite side without the insignia. You might think RID Cliffjumper has the advantage in the accessory department, but you'd be wrong... sort of. He certainly includes an accessory: a motor-mace/engine blaster-weapon-thing. Admittedly it has a cool design, although it never appears in the show, and you can plug into his vehicle mode, too. I like how it looks mounted on the side. FE 'jumper doesn't have any accessories packed-in with him, but he is packin'! Each of his hands can be rotated around to reveal triple-barreled cannons. Perfect for kickin' Vehicon tailpipes. You can probably guess I prefer the flip-out cannons to the ax/blaster thing. The hidden weapons are much more accurate to the TV show where each Transformer carries their weapons internally and can produce them at any time. Whenever toy designers can incorporate that in the figures, I tend to sway towards that version most of the time. Cliffjumper was voiced by Dwayne Johnson (a.k.a. The Rock) on the very first episode of Transformers: Prime where he was almost immediately killed off by Starscream. Subsequent Cliffjumper appearances featured him as a rabid, drooling Terrorcon (not voiced by the Rock) or rescuing Arcee in a flashback scene (with and without spoken lines and featuring a different voice actor). I think it's kind of funny that we've received three action figures based on the Rock's performances in three different mediums (Prime, G.I. Joe: Retaliation, and the WWE) all around the same time. 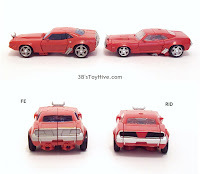 If you have the choice between FE Cliffjumper or RID Cliffjumper, I think you'll be happier with the First Edition figure. Even if you're main collection is RID, which is true for me, you'd be better served by the FE figure. The RID version is undersized even among other RID toys. Hasbro is re-releasing the First Edition series as a TRU exclusive which will include Terrorcon CJ, but I'm not sure if the regular, non-zombie version will also be available. 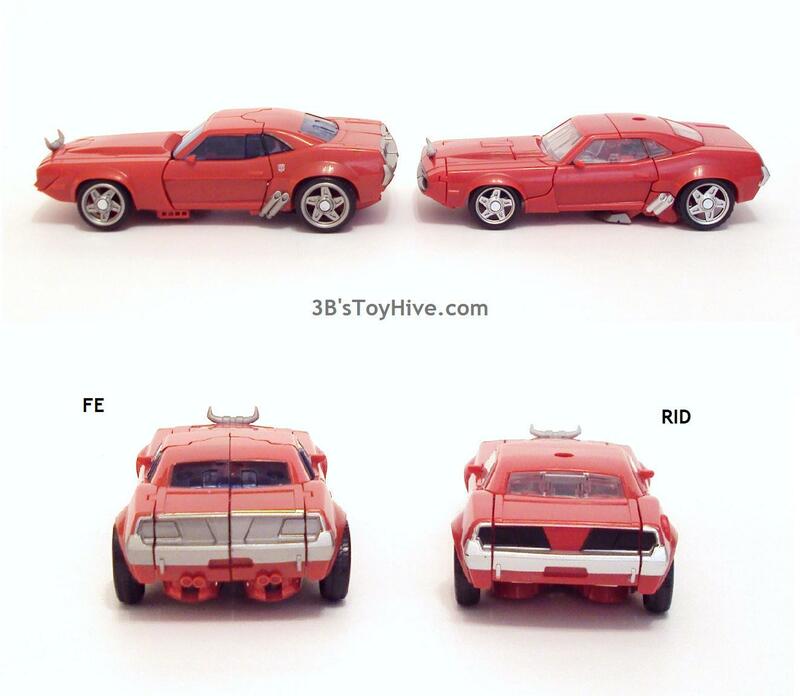 It seems Hasbro and Takara are obsessed with undead Cliffjumper because they've released several versions. I have no interest in the Terrorcon release, so this FE Cliff will be the one I display.